Lisa showing us the product in action! Benefit have just launched their much anticipated liquid foundation, a first for the brand. 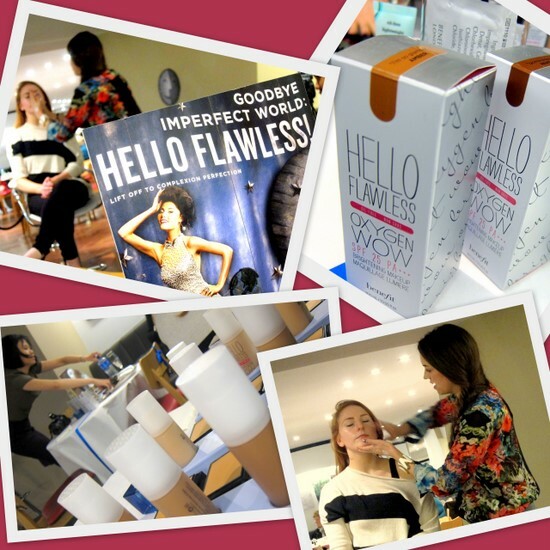 The quirkily named product, Hello Flawless Oxygen Wow, is available in nine shades and is billed as a brightening makeup, offering buildable light to medium coverage. It’s also oil free, with SPF 25. The charming and enthusiastic Lisa Potter-Dixon, Benefit’s Head Make-up & Trend Artist (and Brow Expert! ), was in town last month to tell us all about it, and to show us the product in action. She recommends that you use the product with a primer and always apply with a brush, for a more polished finish. And so you can try before you buy, a little sample of Benefit’s primer, The Porefessional, is included in each bottle of foundation. I was shade matched to ‘I’m so money honey’, which I found gave me a glowy, youthful finish – fans of the dewy look will love it, and though I personally prefer something a little more matte, this will get a lot more wear as we head towards summer. Hello Flawless Oxygen Wow is €35 and on counter now. Will you be checking it out? I'll definitely check this out - I love benefit cosmetics! It sounds great, must try it! Hi, I recently found your blog and just love your makeup reviews! Thanks for the post today and I look forward to following along. Hopefully you can stop by my blog and say hello. if it's available on net, then yes! will check out! got this for me and the mini me - as you can build it up it's great for coverage for her 12 year old skin, without looking like she's wearing any. score. she was the palest, which surprised me, but it looks lovely on her..
Have to say I'm more of a matte girl (normally) myself but i do like this foundation a lot. Have been wearing it for the past few days and getting compliments on how glowing my skin is! I have used this line of shadows and liked it. I'm anxious to check this one out. I like the idea of a layering product as well all need varying amounts of products. I generally like their stuff - so I think I will give this a whirl soon. Ooh, this is very interesting, it ticks all the boxes for me with the description, love that it has spf too, great for summer! Looking forward to trying this out! Sounds like the perfect summer foundation. Wow, it sounds amazing!! I think I would love this! @BravoeRunway I'm pretty sure I heard Benefit is much cheaper in the States so you probably won't have to shell out as much as we do - seems like everything is more expensive here in Ireland! Thanks hun, and Im the other way around, I've only tried e.l.f's eyeshadow, none of the other stuff. Really want to try this as I've been seeing it everywhere lately! I think it may suit me when I'm happy with my skin and not wanting heavier coverage!